It is only on rare occasions that ghosts, ghouls and goblins occupy the library– and this Wednesday evening was very rare indeed. 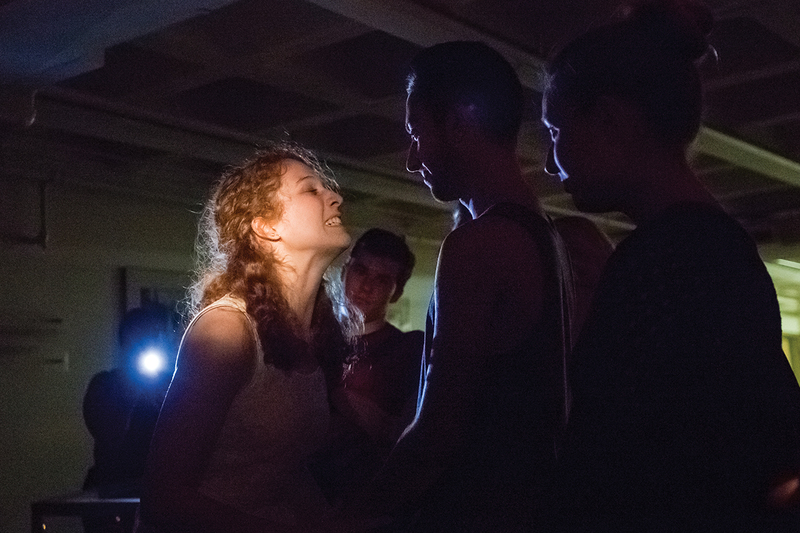 The eighth floor of the Richter Library became haunted grounds for one bone-chilling night as theater arts students clad in supernatural garb lurked around, reciting macabre monologues from the Jackie Gleason Collection. Texts in this collection brim with all things grim and ghastly, from ghosts and spirits to otherworldly mysteries. Jackie Gleason, an actor and comedian from the 1950s, amassed a library of around 1,700 non-fiction books on topics concerning life after death and connections with otherworldly dimensions. After Gleason’s death in the late ‘80s, his widow donated the collection to the University of Miami’s Special Collections. Special Collections Librarian Jay Sylvestre explained that this collection of work was meant to entertain. “Whether or not Gleason actually believed in tarot cards and the ability to tell the future, he believed in the thought behind it; he believed that people believed it,” he said. The actors recited only the most thrilling and twisted works, said theater student junior Myanna Berrin. Berrin read a section about a man who lives in a completely normal neighborhood until, at the very last sentence of the last paragraph, it is revealed that the town is crawling with zombies. The abrupt change of events was intentional, Berrin explained. “Our Director, C. Francis, wanted us to cut off right when it gets interesting, so at the end of every piece, we say there is more, but you have to read it yourself,” she said. Audience members were then invited to peruse a display of the full texts. Though students cannot check out books from Special Collections, they are always available to read upon visiting the library. Sylvestre said that the books were meant to come alive in this spooky seance. “We wanted to have this event to highlight some of the materials in a fun way, so we selected passages to have theater students interpret as if they were spirits of the book,” he said. Attendees were thrilled and enticed, some, like freshman Daniel Barrett, never having been to the Special Collections section of the library. Jay Sylvestre was pleased with the event’s turnout and that many new faces graced the Special Collections floor. This thrilling night of the unnatural concluded with a group recitation of “PLIF: Post-death Life is Factual, Post-death Life is Fun,” leaving attendees, on their dark walk home, to wonder if something could be lurking beyond perception. Special Collections plans to hold future themed showcases, such as a presentation of the archival Pan-Am airline collection.